Also included in the Danish Christmastide tradition is a song by Andersen. “The Infant Jesus” is his only contribution to religious poetry known to us today that has no direct relation to the national church. Andersen actually wrote very few religious poems, and he was not represented in the Danish hymn book until the new edition was published in 2003, which does in fact include “The Infant Jesus” and a poem from 1864 “Jeg har en Angst” (“I have a fear”). [See Andersen’s MS with a transcription in Danish of the poem here]. “The Infant Jesus” has actually appealed to several composers; in addition to those mentioned below, also Robert Schumann (“Weihnachtslied”, op. 79). Andersen published the poem “Barn Jesus i en Krybbe laa” (“The Infant Jesus lay in his Crib”) as a part of December (“Dybt i mit hjerte, hvor hun bor”) (“Deep in my heart, where she dwells”) in the collection Aarets tolv Maaneder, Tegnede med Blæk og Pen (The Twelve Months of the Year, drawn with Pen and Ink). The December part consists of several small poems and scenes in which “The Infant Jesus” text is sung by “De fattige Børn paa Gaden” (“The Poor Children in the Street”). Already at the beginning of 1832 Andersen began to illustrate the months in small pictures, and throughout the year his letters and diaries reveal which parts of the collection have been completed. Apparently December (together with February) were among the last he wrote. The collection was published on 18th December 1832 with a dedication to Frederik VI as one of the high-ranking persons who had helped Andersen, for example with a grant towards his schooling. Andersen was given an audience in order to hand over the book. Shortly after its publication Andersen sent the collection to his friend, the writer B.S. Ingemann, who felt, however, that the poems didn’t really hang together. The Twelve Months was never reprinted as a collection in Andersen’s lifetime, and in his Samlede Skrifter (Collected Works) the first edition of which was published in 1854–79, only four are included as illustrations of the seasons. December is one of these, entitled “Juleaften” (“Christmas Eve”), but Andersen used parts of the other eight poems elsewhere in his later writings. The best known melody today for this poem was written by Niels W. Gade. He composed the song in 1859 and at Christmastide that same year it was published in the collection Børnenes Jul (The Children’s Christmas) op. 36, which also includes four small pieces for the piano. The simple lines of the melody go well with the slightly childish, lyrical form of the text. The song is one of the relatively few simple religious songs or hymns that Gade wrote, despite having been an organist for a large part of his life and therefore familiar with the national church. His melody has become widely known as a children’s song, especially through the collection Børnenes Musik (also called The Stork Book) from 1870, which ran into several editions. But it was not until the second half of the 20th century that Gade’s melody became the most widely accepted. Nowadays one often hears “The Infant Jesus” in an arrangement for a mixed choir, which has been included in several widely distributed choral anthologies, but the appearance of the text in the latest edition of the Danish hymn book has apparently unhesitatingly accepted Gade as the composer. Of course Gebauer, as one of the leading 19th-century composers of songs for children, would also have plunged into Andersen’s simple Christmas song. Gebauer published his Juleaften. Sang for Børn (Christmas Eve, Song for Children) in Copenhagen in 1849, and the song was probably written for his own children. It is certainly a very simple 6/8 movement that accentuates the text, both by the melody and fine harmonious phrasing. Right up to the 1950s this melody was the most widespread, but was gradually superseded by Gade’s. Gebauer also wrote music for several of Andersen’s other poems for children, such as “Hist, hvor Vejen slaar en Bugt” (“Mother and Child”) and several of these, unlike his Christmas songs, have remained popular in Denmark today. Finally, Henrik Rung composed “Barn Jesus i en Krybbe laa” (“The Infant Jesus lay in his Crib”) for a mixed choir in 1866, and the arrangement was published in December the following year. In 1874 a version for song and piano was published in which it was stated, however, that it had originally been arranged “for a choir of different voices”. The arrangement was written for Rung’s distinguished choir, the Caecelia Society, which devoted itself in particular to the classical Italian choral polyphony of the 16th and 17th centuries, but also sang a number of works by Danish composers. “Christmas Eve” was first performed at the choir’s concert in the chapel of Christiansborg Palace in Copenhagen on 29th November 1866, when Mozart’s Requiem (1791) was also on the programme. It could moreover be heard at a few of the choir’s later concerts, but apparently enjoyed no particular popularity as a solo. The song’s at times large vocal leaps also require an experienced singer. In this Swedish version of N.W. 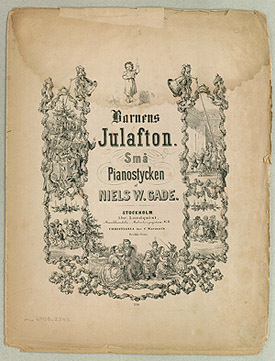 Gade’s Børnenes Jul (The Children’s Christmas) a number of scenes from Christmas Eve are depicted and illustrated in the collection’s small pieces for piano. 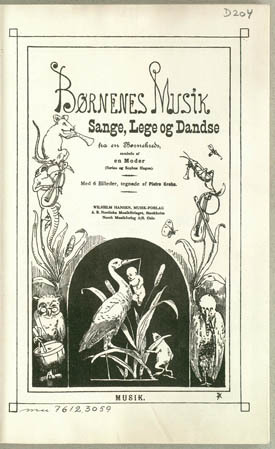 The collection Børnenes Musik (Children’s Music) “collected by a Mother” has been nicknamed The Stork Book. The editors were the music historian and composer S.A.E. Hagen and his wife, Serine, and the book contained just under 150 children’s songs. The collection was dedicated to Hans Christian Andersen, and a great many editions were published from 1870 and onwards. Hagen chose Niels W. Gade’s melody for “The Infant Jesus”, which in this way was widely distributed at an early stage, but none the less only became generally known after 1950.